After Russia, Iran and Turkey’s gold gambit, how about the Europeans? Powell’s scintillating speech (not)… Vancouver home price insanity, 2018 edition… more reader reactions to I.O.U.S.A.’s anniversary… and more! It’s not just our own Jim Rickards who’s on to this “Axis of Gold” thing. This system would have gold backing. China’s gold reserve is substantial and growing — and likely far larger than the “official” numbers indicate. Russia’s gold reserve as a percentage of its economy is the biggest in the world. Iran and Russia have a history of sidestepping U.S. sanctions by transacting in gold. “Gold will be part of the structure of the international monetary system in the 21st century,” predicted the Nobel Prize-winning economist Robert Mundell in 1997. Now 85 years old, Mundell still holds posts at Columbia and at Chinese University of Hong Kong. And one of his most influential students says it might be three of those four “Axis of Gold” nations that make it happen. “As has often been the case, Mundell’s prediction might just be prescient,” writes Johns Hopkins economist Steve Hanke this week in Forbes. We mention Hanke from time to time in The 5 for his “Troubled Currencies Project” — in which he calculates the real-world inflation rate in places like Iran and Venezuela. Usually it’s much higher than the official number, based on his calculations using the black-market exchange rate with the dollar. While Venezuela makes the hyperinflation headlines these days… it’s three other currencies most on Hanke’s radar right now. “The weight of sanctions has clearly created great difficulties for the Iranian rial, Russian ruble and Turkish lira,” Hanke writes. “Indeed, even in the best of times, these are all half-baked currencies with long troubled histories. They are all vulnerable to sanctions. Indeed, their vulnerability should be viewed as threats to national security. “Currency boards have existed in more than 70 countries,” Hanke explains, “and a number are in operation today. Countries with such monetary institutions have experienced more fiscal discipline, superior price stability and higher growth rates than comparable countries with central banks. And who knows? One day the Europeans just might join the Axis of Gold. This week, Germany’s foreign minister Heiko Maas suggested the establishment of a nondollar payments system so that European countries wouldn’t have to abide by the U.S. sanctions on Iran. Maas penned a column for the country’s business daily Handelsblatt — saying Europe can’t afford to let the United States act “over our heads and at our expense. But Maas belongs to the next generation of German politicos after Merkel. He might even be a future chancellor himself. He’s thinking ahead to a day when not only China, Russia, Iran and Turkey move toward “de-dollarization” — but maybe Europe too. To the markets: Today might be the day the S&P 500 sets not only an “intraday” record — but a record close as well. As we check our screens, the S&P has inched above the magic 2,872.87 — which was the close on Jan. 26. The Nasdaq and the small-cap Russell 2000 are also in record territory. The Dow remains the laggard among the major indexes, but it did surpass 25,800 this morning. Traders’ eyes are on Jackson Hole, Wyoming — site of an annual conclave of central bankers, noteworthy this year because it’s the first appearance by Jerome Powell as Fed chairman. The topic of his talk today is “Monetary Policy in a Changing Economy.” Spellbinding! Powell did nothing to rock the boat: He anticipates “further, gradual” increases in the fed funds rate as long as the economy keeps firing on all cylinders. With that in mind, the Commerce Department issued its monthly report on durable goods orders this morning. The “headline” number stunk — a 1.7% decrease, way worse than expected. But if you throw out the notoriously volatile figures for aircraft and military gear, you get a 1.4% increase, way better than expected. Earnings season more or less ended a week ago when Walmart reported. Now comes an intriguing phenomenon. “Believe it or not,” says our income specialist Zach Scheidt, “stocks tend to drift in the direction of their earnings surprise for up to two months after reporting. “This market phenomenon is called post-earnings announcement drift, or PEAD for short, and it’s been observed the market for decades. The commodity complex is in rally mode: Gold is back above $1,200 and crude is back above $69. Fire destroyed this home last December. 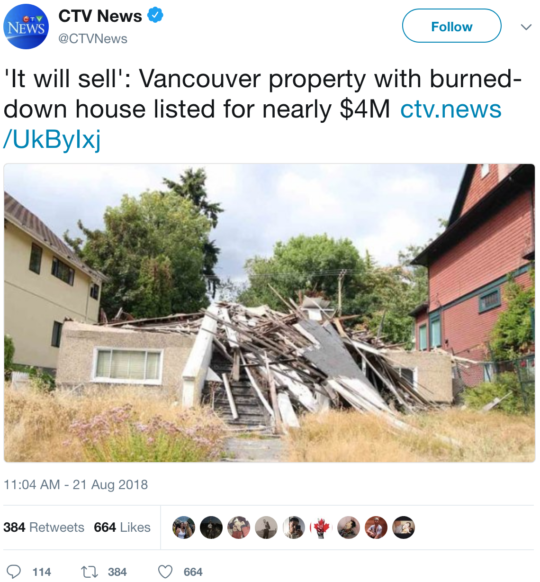 Now the remains and the lot are for sale for C$3.9 million — or about $3 million U.S.
We started taking note of Vancouver real estate prices in 2012 when we paid homage to a website called Crack Shack or Mansion? where you had to guess from a photo whether a home was indeed a crack shack… or a property commanding C$1 million. “If tax cuts are a net positive for the economy, then they are not just borrowing from the future unless offset by spending cuts,” he writes. “If they are just a phony sugar high unless offset by spending cuts, then tax cuts are and cannot be net positives for the economy. “Tax cuts do increase GDP, increasing tax revenues. We should cut spending nonetheless because precious resources should not be squandered on profligate, illegal and unconstitutional spending: Resources are too precious to waste on politicians’ creating dependency by buying votes. “When you say, ‘The growth never generates enough tax revenue to offset the drag of ever-growing annual deficits,’ that contradicts your own argument against tax cuts because it admits tax cuts cause growth and increase government revenues, just not enough. That is not an argument against tax cuts but an argument for spending cuts. “Your argument that tax cuts caused recession in 1991 and 2007–09 is specious because it employs the post hoc fallacy: The 1991 recession occurred after the Reagan tax cuts of 1981, 1982 or 1983 and the 1986 tax reform and the recession a decade ago occurred after the Bush tax cuts of the brand-new millennium; therefore, Presidents Reagan’s and Bush’s tax policies caused those recessions. The 5: Reading literally much? We have nothing against tax cuts, for crying out loud. All we’re saying is they create phony prosperity unless there are spending cuts to match. What’s so complicated about that? And nowhere did we assert the Reagan and Bush 43 tax cuts caused the recessions that followed a few years later. All we said is that the supply-side promises didn’t pan out: Tax revenue did not grow fast enough to offset the reckless increases in spending that took place at the same time. The artificial boom was followed by the inevitable bust — for a host of reasons, some of them having nothing at all to do with tax cuts. P.S. As noted above, small caps have inched into record territory today — delivering big gains for readers of Mike Burnick’s Amplified Income. Earlier this week as the Russell 2000 was climbing, they had a chance at overnight gains of 44% playing call options on IWM — the big Russell 2000 ETF. And that was just half the position. The other half he recommended unloading today for even more gains. Not a bad way to kick-start your retirement plans, no? You can do likewise in just three simple steps. Here’s how you can start.